Hundreds of peace campaigners gathered outside an RAF base today to protest against armed drones being operated from Britain to conduct missions in Afghanistan. 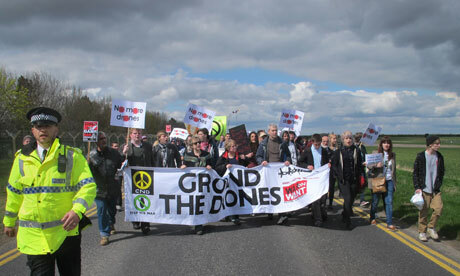 Around 400 demonstrators took part in a march from Lincoln to a rally at nearby RAF Waddington, which assumed control of British drone missions in Afghanistan earlier this week. The Guardian revealed on Thursday that the RAF had begun remotely operating its Reaper unmanned aerial vehicles from the Lincolnshire airbase. The drones were previously operated from a United States Air Force base in Nevada. Chris Cole, a coordinator of the Drone Campaign Network, said the use of Unmanned Aerial Vehicles (UAVs) to wage war raised numerous legal, ethical and moral issues. Speaking near RAF Waddington’s perimeter fence, Mr Cole said: “This is the new home of drone warfare in the UK and there are questions about the growing use of these armed, unmanned systems. In a statement issued on Thursday, the RAF said it had commenced supporting the International Security Assistance Force and Afghan ground troops with “armed intelligence and surveillance missions” piloted remotely from RAF Waddington. The organisers of the protest march and rally are calling on the government to abandon the use of drones, claiming they make it easier for politicians to launch military interventions, which result in greater civilian casualties. Chris Nineham, vice-chairman of the Stop the War Coalition, claimed drones were being used to continue the “deeply unpopular ‘war on terror'” with no public scrutiny. The Ministry of Defence has defended its use of drones in Afghanistan, stating that they have saved the lives of countless military personnel and civilians. Lincolnshire Police have held talks with the organisers of the protest to minimise disruption to the local community. The route of the march from South Common along the A15 to the peace campsite opposite RAF Waddington will see the road closed in three phases to limit inconvenience to motorists. Community policing inspector for Lincoln, Mark Garthwaite, said: “Our aim is to ensure that visitors to the area can participate in peaceful protest but that disruption to motorists and local residents is kept to a minimum.